Chemical fertilizers or inorganic fertilizers are manmade soil enhancers used to raise the level of nutrients found in soil. The natural nutrients found in the soil essential to plant growth, such as nitrogen, phosphorus and potassium, are manufactured synthetically from inorganic material and applied to soil in the form of chemical fertilizers. Although chemical fertilizers improve the growth of plants and increase the yields of fruits and vegetables in a relatively short period of time, there are certain disadvantages of using chemical fertilizers as opposed to organic fertilizers derived from natural sources. The persistent use of chemical fertilizers causes the pollution of ground water sources, or leaching. Chemical fertilizers that are highly soluble get absorbed by the ground more rapidly than they are absorbed by the intended plants. Plants have the capacity to absorb only a given level of nutrition at a time leaving the rest of the fertilizer to leach. Leaching is not only hazardous to groundwater sources but also to the health of subsoil where these chemicals react with clay to create hard layers of soil known as hardpan. As a result of chemical fertilizer use the health of soil and water is jeopardized, not to mention the waste of money and nutrient deficient plants. The presence of a number of acids in the soil, such as hydrochloric and sulfuric acids, creates a damaging effect on soil referred to as soil friability. The different acids in the soil dissolve the soil crumbs which help to hold together the rock particles. Soil crumbs result from the combination of humus, or decomposed natural material such as dead leaves, with clay. These mineral rich soil crumbs are essential to soil drainage and greatly improve air circulation in the soil. As the chemicals in the chemical fertilizers destroy soil crumbs, the result is a highly compacted soil with reduced drainage and air circulation. 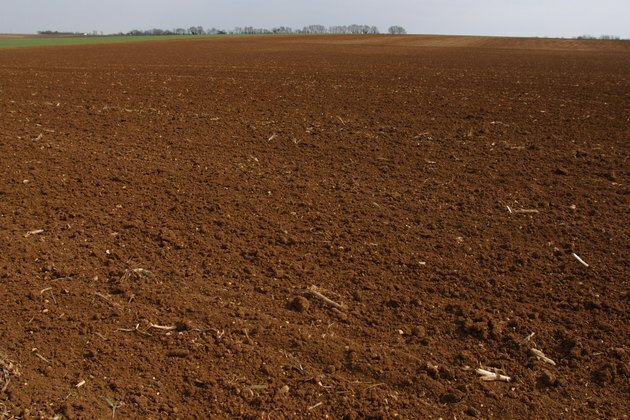 The synthetic chemicals in the chemical fertilizers adversely affect the health of naturally found soil micro-organisms by affecting the soil pH. These altered levels of acidity in the soil eliminate the micro-organisms beneficial to plant and soil health as they help to increase the plants' natural defenses against pests and diseases. These helpful micro-organisms consist of antibiotic-producing bacteria and mycorrhizal and other fungi which are found in healthy soil. The use of chemical fertilizers also jeopardizes the health of bacteria that fix the nitrogen balance in the soil. These nitrogen-fixing bacteria are responsible for converting the atmospheric oxygen into a form of nitrogen that can be used readily by plants. How Do Humans Cause Erosion?